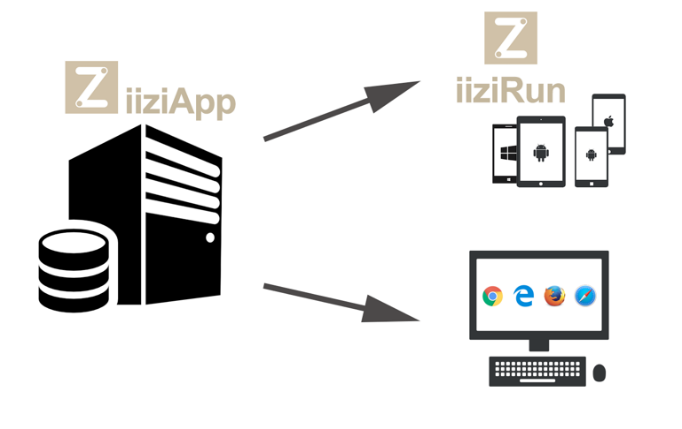 The iizi Platform allows immediate results on both desktop and the devices connected as you design and code your iiziApp. The optimal set-up in iiziGo gives you an immediate result in a web browser on both desktop and the devices connected to your development environment. In this way, the entire life cycle of your app can be previewed in the development stage. The UI properties of your web application are mirrored using streaming between the server side and the client over a WebSocket. This connection is maintained during development, testing and exists between your server and client devices when your iiziApp is in the hands of your customers. On the client side, your app is a web application with access to native capabilities for smart phones and tablet by means of the Cordova plug-in (formally PhoneGap). iiziApps are streamed from the iiziServer to the client. The server side application requires an iiziServer that enables open communication through a web socket connection. There is constant and immediate communication between your server-side iiziApp and the end-user. It provides very fast communication protocol with low latency, meaning that the end-user gets data to and from the server instantaneously. If you are targeting desktop, no client-side app is necessary; on desktop systems, a pure web application interface is used through the installed browser. The UI flow is governed by the focus in the iizi VirtualSpace and a Deployment of iiziApps to the end-user. This is done using the two focus engines built into AppGyro and ClientGyro. The focus model makes it possible to enable devices that are related to the user in question. The application could also continue to run off-line on the end-user device depending on how the iiziApp is designed. The off-line support is not yet available, but is planned. When an end-user starts an iiziApp, a new client session is created in the server’s ClientGyro engine. The ClientGyro is then either starting a new AppGyro application session, or connected to an existing AppGyro application session of the same user. This enables an end-user to start an iiziApp from a phone or other device and then, even in parallel, pick up the same application session from a different phone, a tablet or a desktop system, or to start a new application session. The server and/or application is configured for parallel session support by default, but is optional and can be reconfigured either in the server or the iiziApp in question. Your iiziApp can consist of iiziModule projects and Java projects. It can also refer to libraries and directories containing Java code, both project-based and external. To run the application on an iiziServer, the iiziApp must be compiled into a Jar file. This compiled Jar file – the Application Distribution – is produced in the Application Distributor utility integrated into the iiziGo. The Application Distributor is also available as a stand-alone Java program that you can run from a batch file or build system such as Maven, Ant or Gradle. An automatic translation engine using Microsoft Azure Cognitive Translation and/or Google Translate services is provided to speed up simultaneous development of the localized application for preparing a world-ready application. Select the source language for development and you get automatic foreign language translation in the background. You can view your UI design and data representation on any device, in any language, at any time. Your application’s text content, once translated automatically, can be flagged for verification by a translator or language specialist.